Two decades have now passed since the Horace H. Rackham funds were so generously given to the University of Michigan. In keeping with the vision and the wishes of the donors, the funds have been dedicated to significant cultural and humanitarian interests; to the aid of productive scholars and of selected students of high capacity; and to the research programs of the University centering in the Horace H. Rackham School of Graduate Studies. 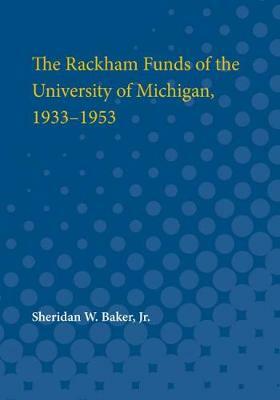 This book was specially prepared to tell the story of the Rackham funds, to set forth the specific accomplishments and results of the beneficence, and, as it were, to account for twenty years of responsible stewardship in discharging this trust. The University of Michigan is a stronger institution because of this support, and with these additional resources has been able to make a far richer contribution in the service of mankind than it could otherwise have done.